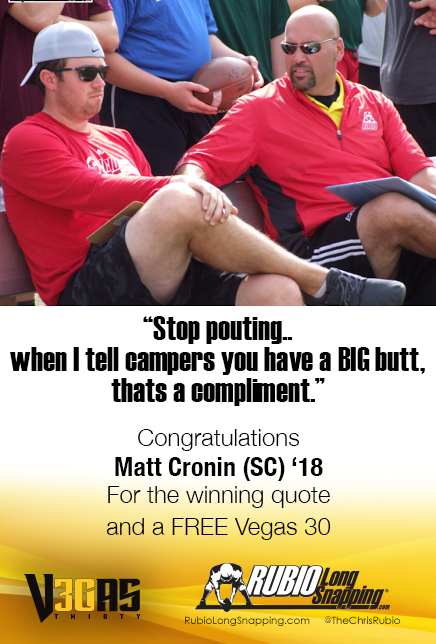 As always, Rubio Long Snapping will be offering up a FREE ADMISSION to VEGAS 30 Contest! This one should be very easy and, therefore, I will not be giving a lot of time to finish it. It is simply going to be a caption contest. The best caption (or captions, there are two people in the photo so you can choose) for the following photo will win a FREE ADMISSION to VEGAS 30 (admission is covered, you will have to take care of hotel, food and travel). With no further adieu, here is the winning picture…..
WHO CAN ENTER: Any Long Snapper looking to earn a FREE ADMISSION to VEGAS 30 ranging the class of 2021 to 2017. WHAT DO YOU HAVE TO DO: Simply email me (Rubio@RubioLongSnapping.com) the best caption for the picture. You can only enter once and the title of the email should read: Your Name, Vegas 3o Contest. Your caption(s) should be in quotations in the body of the email. WHY DO YOU HAVE TO DO IT: You don’t but you probably should if you want a FREE ADMISSION to VEGAS 30! You seriously can’t be that lazy. If you win and you have already purchased VEGAS 30, I will push your free admission to VEGAS XXXI in January. WHEN DO YOU HAVE TO DO IT: 48 hours from now, the contest is over! Bottom line, contest ends on Friday, March 10th at noon pst. As season starts, parents can tend to be filled with tons of emotions: joy, excitement, fear, nervousness, etc. All are normal and should be felt if your son is going to play on Friday, Saturday or even Sunday. Here are a couple of things to remember…. You aren’t the first parent to go through this and you won’t be the last. Just like I tell my Long Snappers, if someone else has done it, so can you. Review the mental aspect with your son before the game. Remind him, and yourself, that he, and you, are ready for this and he, and you, will dominate the moment. Make sure you hire someone else to film the game (one of your son’s friends or something….”Hey Johnny, here’s ten bucks, film the whole game, do it well, keep the camera on the Long Snapper and keep quiet”) so you can focus on the whole experience and not be stuck behind a camera seeing the game through a three inch screen. Prepare for the game with your son. After he snaps a great ball, you will want to give him signals to show him how great he did…thumbs up, big outstretched arms emulating a Rubio hug, blow him a kiss (get his lady friends involved). Breathe. Have fun. Believe in your son. Have confidence in him. Trust me, it will overflow into him. Enjoy every single moment you have with your children. This is an incredible time in your life and you need to embrace every single second of it. What Do You Get at a Rubio Long Snapping Camp? INSTRUCTION – There is simply no doubt that you will receive the best instruction in the country at a Rubio Long Snapping camp. It is unprecedented and known by college and NFL coaches throughout the country. When you sign up for a Rubio Long Snapping camp, you get perfection. I am there, my senior staff is there, on time and we don’t leave early. EXPOSURE – Every camp that Rubio Long Snapping run offers the most exposure possible for Long Snappers. I bombard several avenues to make sure my Long Snappers are visible to all. The Rubio Long Snapping YouTube Channel has over 970,000 views (this is all just for Long Snapper….NO kickers are on the page). RubiosBlog.com has been viewed well over 1,000,000 times. @TheChrisRubio on Twitter has over 5,750 followers (many of which are coaches) and the Rubio Long Snapping Facebook Page has over 5,600 followers (many of which are coaches) and stories in publications all over the world make Rubio Long Snapping the one stop shop for the most exposure in the country. PLAYER PROFILE PAGE – As soon as you perform in a camp in the fall (or after) of your freshman year, you get a PLAYER PROFILE PAGE….for free! This player profile page is controlled by me and it can have any information you wanted added to it at anytime. You can use it for your recruiting purposes throughout high school. RANKINGS – As soon as you perform in a camp in the fall (or after) of your freshman year, you get a ranking. I don’t rank off a target. I don’t rank off a formula. That would be ignorant. I rank off of THIS blog that describes what makes a Long Snapper great. That ranking can be adjusted anytime I see you live. Coaches look to these rankings religiously in their recruiting of Long Snappers. YOUTUBE VIDEO – At every single Rubio Long Snapping camp you attend, you will be filmed for a YouTube video. Those videos will be placed on your free player profile page. You can use the video at your own discretion. It is yours and there is no extra charge for this service. FILM SESSION – At Rubio Long Snapping camps, I will go in with you to a classroom and review the morning sessions. Long Snappers attend but I really want the parents/guardians to attend as well since this is when a majority of the learning will take place. RECRUITING SEMINAR – At Rubio Long Snapping camp, Chris Sailer and I run an hour long recruiting seminar where we hit on some key topics and always open it up to a Q&A session for the specialists and parents. You will not leave without all your questions answered. Trust me when I tell you, I could keep this list going and going and going. Things like Friendship, Confidence, Humor are just some immediate things that pop into my head….see you soon! Remember, Not only on the field, but off. I am not your coach. I am your Rubio and I will be there for you. Long Snappers are obviously incredible athletes built with dashing good looks, but are they also creative and intelligent?Obvious answer is YES, but let’s see what we are dealing with throughout the world. Every Vegas, I try to have a contest to give away a FREE admission to my Vegas Event. This year will be no different. And, since I know my Long Snappers can tend to be a bit apprehensive about doing any extra work, I have created a contest with the least amount of work in the history of Rubio Long Snapping. WHO: Any Long Snapper ranging from 8th grade to second year of JC that would like a chance to earn a FREE admission to VEGAS XXVIII! WHAT: You must create an original Haiku (s) that pertains to Long Snapping AND Vegas. For those of that don’t know, a Haiku is simply a Japanese poem of seventeen syllables, in three lines of five, seven, and five. If you don’t know what a poem or a syllable is, bless your heart and start focusing more in school for the love of all that is holy. Each haiku must be on the same page and must be hand-printed by the Long Snapper (if I can’t read it, it won’t get read). If you have one haiku, you will have just one page for me. If you have two haikus, you will have only one page for me. If you have three haikus, you will have only one page for me. WHEN: The entries must be in my mailbox by no later than March 16th, 2016. FYI: I do NOT live in a big city. Mail can take a looooong time to get to me. Plan ahead as I will NOT take any late entries. WHY: To earn a free admission to VEGAS XXVIII! The winner will be announced on March 21st, 2016 (early registration deadline). The winner will get their admission covered by me. The winner will still be responsible for travel and accommodations. In August, I posted a contest sponsored by the Frese family in honor of their grandfather, Hank. Hank was a former Marine and always present at Rubio Long Snapping Vegas Camps. He was an absolute stud and there are some great stories of him at the camps. The basics of the contest were as follows…. A Long Snapper, 7th grade to JC, will have to create a video (no longer than one minute in length) that incorporates snapping, their grandparent (if you don’t have one, find one) and the song HERE. Now, once you hear the song “Papa With His Pants on High”, you will understand that either the Long Snapper or the grandparent MUST be in high pants. Also, the song must be heard while the film is going. The funner it is, the better it is. Several entries came in and the decision for the Frese family was so hard, they decided to offer three prizes! First place would receive a free admission to Vegas, while 2nd & 3rd place would receive a small group session! This is incredibly generous of them and I know the whole Rubio Long Snapping family thanks them. Congratulations to GABE HANTZ on THIRD place! Congratulations to ROSS ARROYO on SECOND place! And, a big CONGRATULATIONS TO THE WINNER OF THE CONTEST, CALVIN MAHER!!! For the next installment of “Where Are They Now?” we head to Southern California to hear from Rubio Long Snapper PJ Tobyansen (2006, CA). PJ was at UCLA with Rubio Long Snapper Christian Yount and is one of the most vibrant people you will ever meet and comes from an incredible family. Wait until you seen what he is doing now! 1. What is your current occupation? After my career at UCLA I have been working in the film industry in Los Angeles area and have done so for the past five years. My past employers have been Fox, Sony, and Marvel studios. I am currently working for Disney on the film The Jungle Book as a Visual Effects Coordinator for the past year and half. 2. Where do you live? 3. Married/ Kids? Yes, no kids. 4. What is your fondest memory of your time playing college football? I have so many good memories that I would love to share about my time playing college football. But I will share two, meeting my wife for the first time at UCLA, and running out of tunnel at the Rose Bowl the very first game of my career. I will Never forget both of those memories. 5. If you could give ONE bit of advice to the current Rubio Long Snappers, what would it be? For all current Rubio Long Snappers my one bit of advise would be the following. Work on the little things in life, and continue to strive for greatness. You made the right move and your a Rubio long snapper. Rubio hammers into each an everyone of his snappers muscle memory. IT WORKS, plan and simple. You don’t get good muscle memory if you don’t work on the little things and your fundamentals. Just continue to grow and practice the little things, the little fundamentals, work work work. If you keep adding 1% to your game each day by practicing this approach you will see your results shine. And I can assure you it carries over into your professional life. 6. If you could give ONE bit of advice to the current Rubio Long Snapping PARENTS, what would it be? 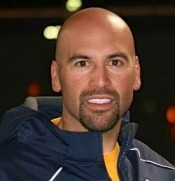 For all current Rubio Long Snapper parents my advice would be patients, TRUST RUBIO he is a wise wise man. 7. When was the last time you snapped a ball and for what reason? The last time I snapped a football is actually a very funny story. The day before my wedding Friday June 26, 2015. Kai Forbath (Washington Redskins) who I grew up with and played football in HS and College. We were hanging out in my hotel suite and just messing around and catching up. My dad had a football there and Kai was begging me to snap to him for old time sake. Just to see if I still had it. I reluctantly agreed, thinking to myself man its been almost THREE years since the last time I snapped a football. So we had a good stretch of carpet 15 yards all that you need. I fired my first snap back as hard as I could and almost destroyed the thermostat on the wall. Kai yells at me “PEEJ!! a little off there! !” I screamed back hahhaa ok!! just getting warmed up here, give me a second!! I made a little correction and fired the next 5 perfect snaps back to him. I still had it!! He calls my parents in and goes he still has it!! I said two words to my parents MUSCLE MEMORY. It probably helped that I had an adrenaline rush going because it was the day before my wedding but I’ll take it! 8. If you could go back and play football in college again, would you go to the same school or a different one? Why? If I could go back and play college football again, even tho I did not play, I would still go to UCLA as preferred walk-on. I was a part of a GREAT TEAM, It was the best time of my life. I met my wife and made great memories with team mates and friends that will last me a life time. I also get the greatest kick out of telling my co-workers and friends that two out of the three players in my position group at UCLA play currently in the NFL, and yes I was the 3rd that didn’t make it. I’m so proud of those guys, and proud to be a Bruin! 9. Any regrets during college? Something you wish you had done or maybe hadn’t? I have no regrets about my choices in college I would do it the exact same way. I worked very hard to contribute to the team. I learned a lot from my time as a student athlete and I am very grateful and so fortunate to have done so. 10. What tremendous thing have you been a part of or experienced since you graduated? The most tremendous thing that I have been apart of since my graduation from UCLA would be first and foremost my Wedding two months ago to Julie who was a former student athlete and national champion 3rd baseman for the UCLA softball team. It was the greatest moment in my life. Second would be my career I have worked on some of the greatest movies to come out over the last five years. I have worked on the following movies Jack the Giant Slayer, Alvin and the Chipmunks, Star Trek into Darkness, Iron Man 3, Thor: The Dark World, Captain America: The Winter Solider, Guardians of The Galaxy, and now The Jungle Book. Every movie feels like a new a season and a tremendous experience. Every single year, Rubio Long Snapping offers up a FREE Vegas admission through some sort of contest. This year is no different. Rubio Long Snappers Nolan and Jordan Frese recently had their grandfather, Hank, pass away. Hank was a former Marine and always present at Rubio Long Snapping Vegas Camps. He was an absolute stud and there are some great stories of him at the camps. Here is a little about Hank…. Hank was a former Marine and high school football coach. He played football for the Minnesota Golden Gophers, as a halfback, on full scholarship. He had two grandsons play Texas HS football and go on to long snap at the next level (there’s an 8 yr old grandson we’re working on). He also has two granddaughters – Mikayla (21) & Marlena (18) – who are very gifted musically and have their own band – The Nesting Dolls. http://thenestingdolls.com/ . “Papa Hank” attended every snapping camp and concert he could possibly make. So, the Frese family would like to honor Hank by creating a snapping scholarship to VEGAS. A Long Snapper, 7th grade to JC, will have to create a video (no longer than one minute in length) that incorporates snapping, their grandparent (if you don’t have one, find one) and the song HERE. Now, once you hear the song “Papa With His Pants on High“, you will understand that either the Long Snapper or the grandparent MUST be in high pants. Also, the song must be heard while the film is going. The funner it is, the better it is. The Frese family will do all of the judging. All entries must be in by October 10th and must be emailed to Rubio@RubioLongSnapping.com. The footage must be presented on YouTube with the title: Rubio Long Snapping Vegas Contest for Hank! The winner will be announced on Thursday, October 15th! Enjoy and I can’t wait to see these videos! Best of luck to all the Long Snappers! If you are reading this on your laptop, you can listen to the podcast below. As promised, here is the audio of Chris Rubio of Rubio Long Snapping being interviewed by Tony Luftman of CBS Sports Radio. In just 12 years, Chris Rubio, President and Owner of Rubio Long Snapping, has become the #1 Long Snapping instructor in the country and the go-to man when a college coach needs a Long Snapper. Colleges from across the country rely on “Rubio’s” word day in and day out on who the best Long Snappers are in the country. Rubio Long Snapping has assisted in over 300 Long Snappers earning FULL SCHOLARSHIPS tomajor colleges and universities just for Long Snapping and many into the NFL as well. VEGAS XXVI Contest AND Winner! The people have spoken and the winner, with 47% of the vote, of the VEGAS XXVI Trick Shot Contest is…BROCK ASSEL (VA, ’18)! Congratulations to Brock and all of the other Long Snappers that entered. See you all at VEGAS XXVI on May 9-10! Another Vegas means another Vegas Contest! Let’s see which Long Snapper will win a FREE admission to VEGAS XXVI! WHO: Any Long Snapper from the 8th grade to 2nd year of Junior College that would like a FREE admission to VEGAS XXVI in May! WHAT: A Long Snapper must create a YouTube video showing one, just one, incredible snap. Make it as creative as you want. Involve a car (be safe), snapping with a crowd of lady friends around, snapping at a mall that is packed, etc. The snap must be creative, 15 yards and solid. Rubio Long Snapper Zach Smith of USC made a full on trick shot video (see below) that went viral two years back with several snaps. I am asking you for ONE glorious snap that is super creative and on target. WHEN: All entries must be uploaded to YouTube with the title: Your Name, Rubio Long Snapping VEGAS XXVI Contest. Once they are uploaded you must email them to me at Rubio@RubioLongSnapping.com. All entries must be submitted to me by no later than Monday, April 6th, 2015. WHERE: Wherever you want, just be safe. Why Not Just Have a Lineman Do It? Rarely, and I mean RARELY, do I get fired up about something but the above question seriously upsets me. The more that Rubio Long Snapping grows and the more that Rubio Long Snappers get picked up for college, the more you will hear/read/see people that think they know what they are talking about in regards to football and Long Snappers. These “experts” might be on Twitter, Facebook and blogs all over the country spraying their “wisdom” to anyone that will swallow it. 99.9% of the time it is REALLY, REALLY ignorant. For instance, I saw something today on Twitter where someone was disgusted because their team had offered a Long Snapper a scholarship (given, it was a Rubio Long Snapper) and they simply couldn’t figure out why the coaches didn’t just make a lineman do it. Here is the answer that you can feel free to cut and paste for the rest of your Long Snapping loving life…. Asking a lineman to become a Long Snapper is like asking a ’70s Cadillac El Dorado to drive like a 2015 Ferrari. They are two completely different types of machines meant to do two completely different things….kinda like a lineman and a Long Snapper. End of discussion. Drops mic. I’m outta here! VEGAS XXV Contest with SoloShot! Every year, Sailer and I have a contest as we head towards our big Vegas Events. The contest usually entails a Long Snapper, kicker or punter taking a creative photo either “Rubioing” if you are a Long Snapper or “Sailering” if you are a kicker/punter. Since VEGAS XXV is going to be the biggest and best Vegas Event we have ever had, we have stepped up the game. SoloShot has told us they want in on the contest and they are putting up a BIG prize for the winners. The contest entails you must follow @SOLOSHOTupdates on Twitter and Instagram, then whenever taking you’re desired photo of “Rubioing” or “Sailering” en route to VEGAS XXV, tag @TheChrisRubio (obviously if you are a Long Snapper) or @Chris_Sailer (if you are a kicker/punter) as well as tagging @SOLOSHOTupdates on Twitter AND Instagram. One winner will be selected by Rubio / SoloShot and the other by Sailer /SoloShot for most creative post. The winners will be announced on Saturday at 8 pm pst. and will receive a Base and Tag package. retail value of $399 This package will keep you’re desired camera pointed at you from up to 2,000ft away capturing all of you’re training sessions. May the best Long Snapper and kicker/punter win! Game on! ASK RUBIO – Favorite Airline, Mentors, Having Dinner with _______ and Which President Could Snap! You are a very frequent flyer, What’s the best airline to fly on and why? I live in a very small area with an even smaller airport that only has two airlines available: Alaska and Delta. I fly Delta A LOT and they really do a good job. Only have had two or three issues in the past two years which is impressive (probably around 300 flights). I gotta go with them and I also loved the time I flew on Virgin. It was like a club in the air. Very cool setting. Did you have a mentor (outside of family) who influenced your life growing up or even currently ? Also, if you could break pizza ( while washing it down with Jolie’s strawberry shortcake) with 3 people in history ( alive or dead) , who would they be and why ? Not really. I soak a lot in from my friends and family. I tried to take a lot in from them since they are all such great people. I only surround myself with great people so it is easy. If I had to choose one, it would probably be Sailer since he got me going in the Long Snapping business. Love the question about breaking pizza with some people. I would choose: my grandfather on my mom’s side because he was so funny in his own way (the man would park by hitting anything in front of him. He insisted that is what bumpers were for), Jesus just so I could ask him a ton of questions and my dad simply to ask him some questions as well (you’ll learn more about him in the movie RUBIO). As a history school teacher, which former President would be the best long snapper? I’d say Ford or Nixon, at least they played football. But I can see Washington or Lincoln being fine after a few Rubio camps. Maybe some dark horse, say Millard Fillmore? He was only 5’9″ so maybe not. I would have to go with Lincoln. He was built long, had a nice frame and handled extreme pressure well. Yeah, can’t go wrong with Lincoln. Remember, if you would like to ASK RUBIO a question on any topic (honestly, it shouldn’t be on Long Snapping since you can find almost all questions answered on my blog and on RubioLongSnapping.com, just go ahead and send your question(s) to Rubio@RubioLongSnapping.com with the subject line: ASK RUBIO. ASK RUBIO – Comfort after overeating, my days as a teacher, snapping Damon?!?!? the holiday season is upon us, and there will be an abundance of eating. Do you recommend a recliner or a couch after the second helping? Personally, I have to go with couch. If one really does some damage at the table, a chair (recliner or not) won’t suffice. I like to have the option of leaning right into a full lay to a pass out and a couch is the only thing that can make that happen! When did you decide you wanted to be a history school teacher? After almost 6 years of teaching history was it a difficult decision to stop teaching school? When I was in the 3rd grade, I knew I would be a teacher. I have many family members that are teachers so it was very familiar to me. I loved teaching (majority of teaching time was with 6th graders) because to me, it was a lot like telling stories. As long as I could get the kids to remember the stories (the history), I would be doing my job. There is a lot about this aspect of my life in the movie RUBIO. In the movie The Big Lebowski. If “the Dude”, Walter, and Donnie were the kicker, Long Snapper, and holder. I have thought long and hard on this question and I believe The Dude would be the Long Snapper, Donnie would be the holder and Walter would be the kicker. Here is my reasoning…A Long Snapper must be calm and collected, and no one is cooler than The Dude. The Holder has to just kinda fit it, hence Donnie. Kickers are usually little angry man with fits of rage….hello Walter (not little, but definite anger issues). What are your favorite tunes for workouts, game time, and just listening in general? I listen to A LOT of music. A LOT. Best band for me is Pearl Jam. They are my tops. Next would probably be Michael Bublé. Guy is tremendous. Jolie loves concerts so we do a bunch of those when I have time. Best I have seen were Zac Brown Band, Buble, Pink, Garth Brooks and of course, Pearl Jam. I listen to all for all events. Doesn’t matter. What are some foods that you like and dislike? Here are the ones I love…. – I am huge fan of pizza. Love it. I could eat it every single day, every meal, hot or cold. Love it. Best pizza I have ever had is Southway in Lewiston, ID. My standard is: stuffed crust, pepperoni, sausage, extra cheese, extra jalapenos, ranch and extra pizza sauce on the side. – I am also a massive fan of desserts. The richer, the better. My favorite might be some sort of strawberry shortcake monstrosity Jolie makes that is in a tower jar thingy. I tend to black out eating it. It’s phenomenal. – S’mores. Love them. Go to the Melting Point at some point in your life and get the S’Mores fondue chocolate thing. I have yet to have that and not burn my mouth on it cause I refuse to let it cool. So worth it. – Franks Red Hot Sauce. I tend to put it on anything. Try it on salads, you’re welcome. – Bacon, duh. Best I have had is up at Coeur d’Alene Resort. It has some sort of maple party going on within it. It’s like a flavor explosion in your mouth. Here are the ones I absolutely loathe…. – olives. Gross. To me, eating an olive would be the same as chewing on a killer whale. Black, salty and rubbery. I’m out. Disgusting. – mushrooms. Not sure, I just don’t like them…on anything. Who is your favorite character in the movie Rudolph the Red Nosed Reindeer and why? My personal favorite is the Abominable Snowman aka The Bumble..a very misunderstood character, not unlike a Long Snapper. I would have to agree. Anything that large and hairy is a sure fire win for me. Bless his heart. Starting tomorrow, I will begin an “ASK RUBIO” column within this blog. Bottom line, you ask me a question, any question, and I will answer it….. BUT, I will do it my own way and in my own words (think Rubio turned up to level 10+). So, feel free to pepper me with any questions you have on any topic you would like me to cover. This is open to all…grandparents, parents, Long Snappers, lady friends, etc. Just go ahead and send your question(s) to Rubio@RubioLongSnapping.com with the subject line: ASK RUBIO. FYI: First one will come out tomorrow at 10:00 am pst and will deal with a Long Snapper and his girlfriend. Be ready…. Since it always seems to happen anyways, I thought it would be nice to have an official Rubio Long Snapping Halloween Contest! It will be real simple, the best Rubio Long Snapping themed pumpkin and/or costume wins a Rubio Long Snapping shirt and hat! WHO: Any Long Snapper that wants to enter. Age doesn’t matter for this one. WHEN: All photo entries must be to me by October 31st at midnight eastern time. WHERE: Send all entries to Rubio@RubioLongSnapping.com. Best of luck and you may enter as often as you’d like. Let the games begin! Enough is enough, let’s vote on it! Sailer and I have this argument all of the time, so you guys might as well get involved. Macaw – My grandmother. She is 94. I think. She thinks. Anytime you ask her she bumps it up simply to be the oldest person around. She hates when she is not the oldest. I always try to point out someone that looks older and tell her they are older (I don’t even know the person, just do it to keep her fired up). She then proceeds to hit me with her cane….which she really doesn’t need and only uses it for abusing her grandson…me:) Yet again, I embrace since hitting me with it keeps her spry. Contest for a FREE VEGAS XXV! Every year, I try to have a contest to give away a FREE admission to my Vegas Event. This year will be no different. WHO: Any Long Snapper ranging from 8th grade to second year of JC that would like a chance to earn a FREE admission to VEGAS XXV! WHAT: You must create an original Haiku (s) that pertains to Long Snapping. For those of that don’t know, a Haiku is simply a Japanese poem of seventeen syllables, in three lines of five, seven, and five. If you don’t know what a poem or a syllable is, bless your heart and start focusing more in school for the love all that is holy. WHEN: The entries must be in my mailbox by no later than October 1st, 2014. FYI: I do NOT live in a big city. Mail can take a looooong time to get to me. Plan ahead as I will NOT take any late entries. WHY: To earn a free admission to VEGAS XXV! The winner will be announced on October 15, 2014. The winner will get their admission covered by me. The winner will still be responsible for travel and accommodations.